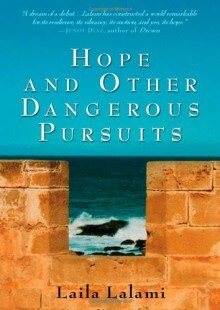 Hope and Other Dangerous Pursuits marks the debut of an exciting new voice in fiction. Laila Lalami evokes the grit and enduring grace that is modern Morocco. The book begins as four Moroccans illegally cross the Strait of Gibraltar in an inflatable boat headed for Spain.What has driven them to risk their lives? And will the rewards prove to be worth the danger? There’s Murad, a gentle, unemployed man who’s been reduced to hustling tourists around Tangier; Halima, who’s fleeing her drunken husband and the slums of Casablanca; Aziz, who must leave behind his devoted wife in hope of securing work in Spain; and Faten, a student and religious fanatic whose faith is at odds with an influential man determined to destroy her future. Sensitively written with beauty and boldness, this is a gripping book about what propels people to risk their lives in search of a better future. Though set in Morocco, not Mexico, and the body of water crossed is the Mediterranean, not the Rio Grande, the stories of the desperate immigrants told in this book are eerily similar to those of many new Texans. The writing is lovely and the stories are captivating.